We’ve all seen those Sarah Mclachlan commercials; sad music playing with all those sad dogs in cages. Those ads alone have generated more than $30 million for the ASPCA. And the reason they’re so successful? They appeal to the heart, not the brain. This is also why the Hope For Paws videos get millions of views and shares. They appeal directly to our emotional side. They show how much of a difference a single rescue makes, and that makes us feel like we can all make a difference. Appealing to the heart isn’t a new strategy, nor is it just applied to animal causes. Studies have found that feelings are what drive charitable donations, not analytical thinking and statistics. A) Any money that you donate will go to Rokia, a seven-year-old girl who lives in Mali in Africa. Rokia is desperately poor and faces a threat of severe hunger, even starvation. Her life will be changed for the better as a result of your financial gift. With your support, and the support of other caring sponsors, Save the Children will work with Rokia’s family and other members of the community to help feed and educate her, and provide her with basic medical care. B) Food shortages in Malawi are affecting more than three million children. In Zambia, severe rainfall deficits have resulted in a 42% drop in maize production from 2000. As a result, an estimated three million Zambians face hunger. Four million Angolans — one-third of the population — have been forced to flee their homes. More than 11 million people in Ethiopia need immediate food assistance. Personal stories, or what academic researches call “identifiable victims,” are those that drive the most donations. Rokia’s personal story (mentioned above) is much more likely to receive donations, rather than a plea on behalf of all famine victims. When giving money to charity, researchers found that people don’t “value lives consistently.” Large amounts of donations are usually concentrated on a single victim with a personal story, rather then a whole village suffering after a tragedy. The heart rules the brain when it comes to charity and donations. We’re more likely to give money to single victims, even though we statistically know that disbursing the money throughout an entire village would help more people. So what does all this have to do with networking dogs online? 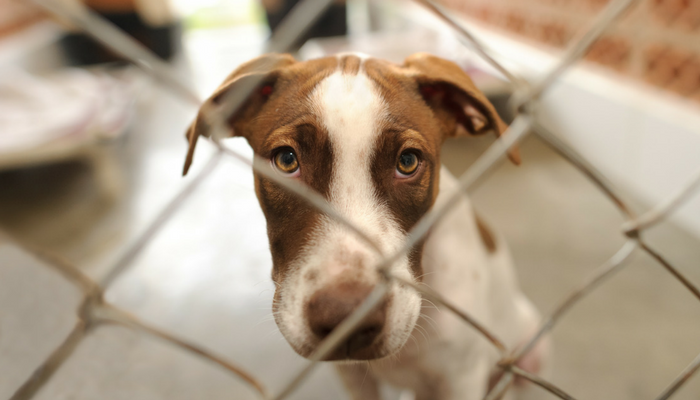 The same principles that big organizations use to gather support for human victims works just as well for animal shelters and rescue organizations. If we look at the videos from Hope for Paws we can see this in action. They focus on one rescue at a time, and they show us how much of a difference each of us can make. When it comes to networking animals remember that emotions work. Great photos, videos, funny taglines, and personal details help us identify with the individual animal in need. Here’s 6 tips for making the most out of your networking efforts. When it comes to networking animals online remember to make it personal. Don’t skip out on the history or events the dog may have been through; those help make dogs stand out. 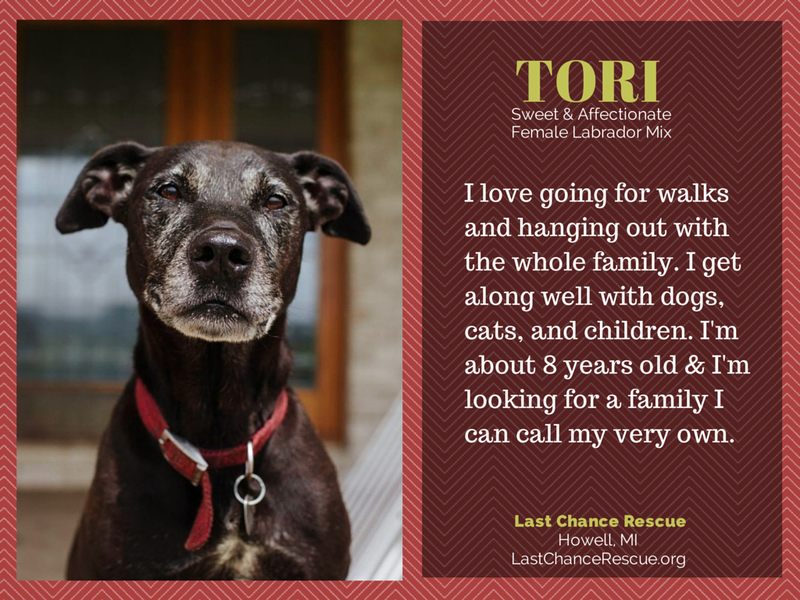 There was a dog named Tori at a local rescue that I fell in love with instantly, so I decided to do some networking. I took one of her photos and added in the details. That way if people wanted to share her they didn’t have to research her themselves, the location/age/story were readily already available. These types of photos do really well on Twitter and Facebook. If the animal you’re networking is a senior be sure to share on groups that specialize in helping senior dogs find homes – same goes for special needs, local groups, and breed specific rescues. There’s a lot of specialized advocacy and rescue groups on Facebook. When networking animals choose the statistics you use carefully. We connect better by using smaller numbers. 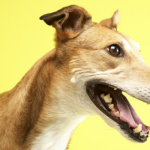 The chance to save 1 out of 10 dogs, rather than 50 out of 500, sounds better. It elicits more of an emotional response, even if the percentage is the same. It’s hard for people to generate feelings towards statistics and big numbers. We feel overwhelmed when faced with daunting statistics. There are millions of homeless pets in shelters, but sharing that statistic alone won’t compel people to help. If anything it makes the problem sound hopeless, and that’s the exact opposite when it comes to the reaction you want. You want to inspire hope in your reader, and show them how they can make a difference. We know that we can’t solve the pet overpopulation ourselves, but we can see how much of a difference we can make for one animal in need. Networking a dog or two at a time seems counterproductive, but remember that your effectiveness is what counts. If your goal is to get dogs adopted and generate donations the more people you reach the better. And the ones that generate the most shares are the personal stories of an individual dog in need. The sooner your chosen dog gets adopted or sponsored, the sooner you can start networking your next one. If you’re sharing 50 photos of dogs in cages a day your readers are going to feel hopeless. As sad as it is (considering the number of homeless animals in the United States) remember that those personal ones are the ones that will stick out in a flood of nameless dogs. Those are the ones that will get that dog adopted, and those are the ones that will get more people involved in helping their local shelters. It generates interest in that dog, but it also helps show that there’s a lot of great dogs just like him waiting to be saved. Who can forget “I died today?” It’s the story of a dogs last day on earth, and I don’t think there’s a single person on earth who didn’t feel all the feels when reading it. And if you did read it I bet you remember it pretty well. Now that story isn’t about animal networking, but it does show what the power of emotion can do in terms of traction. When you appeal directly to someones heart they’re more likely to share. All those wonderful Hope for Paws rescue videos do the same thing. They’re emotional and inspirational; they get millions of shares and views. People don’t remember every article they read, but they do remember the ones that made them feel. If you can appeal to the heart you’re more likely to receive the shares needed to effectively network an animal in need. 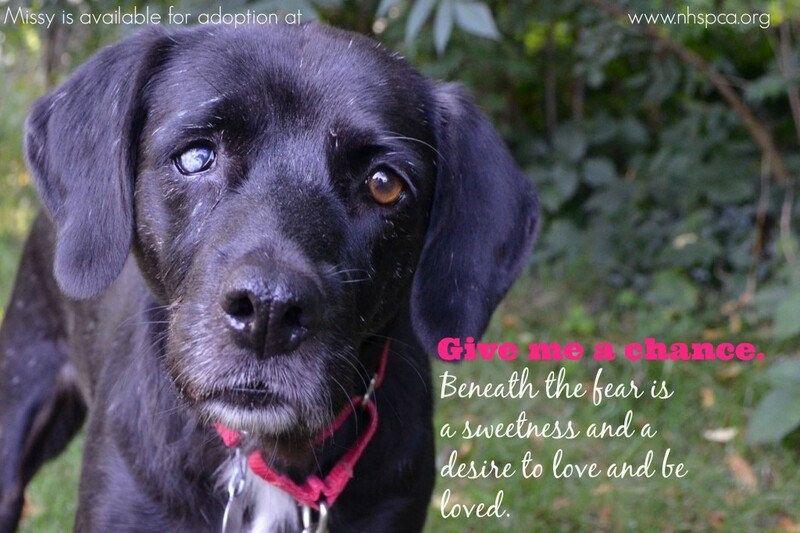 New Hampshire SPCA / Missy who is currently available for adoption. The sad eyes tell the whole story. The quote is perfectly fitting for her and this definitely gets an emotional response from me. I can picture myself adopting her & giving her the love she deserves. Bad example. No eye contact, the dog doesn’t seem to have a name, just a number. If I posted this photo I don’t think anyone would share it. It makes me feel depressed rather than hopeful. The first example is Missy is from the New Hampshire SPCA; they’re really good at making these simple yet compelling photos for their animals. Nothing too flashy or wordy. Just a great photo and message. The great thing about the Missy photo is that it’s pretty general. You don’t have to personally know the dog to write a great tagline like hers. Just knowing her name and that she’s fearful can give you enough to write a great quote. After looking at her I can tell that she deserves a great home and I’d love to help. Compare this to the photo of the second dog. 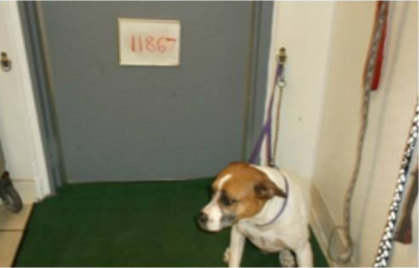 There’s no eye contact, he’s leashed to the wall, and the only identifier is the number 11867. Even though our brains tell us that the dog in the second photo is just as in need of a new home we’re not nearly as emotionally compelled to act or share. 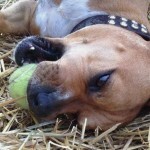 Many rescues take great photos of their dogs (like Missy), but there are some shelters that only use the intake ones. If your local shelter uses photos like the bad example seen above, reach out and see if they’ll let you take photos yourself. Many of the shelters in my area have great photos done by a number of local photographers. If you’d like to try taking some photos yourself here’s a set of videos with some great tips on photographing shelter pets. When networking an animal with a less than desirable photo, try to find out their name. (unfortunately some shelters don’t have a naming system) It’s a lot easier to remember “BUSTER” than 11867. If you only have poor quality photos of an animal to work with try to do some magic with an online photo editor such as Picmonkey, Canva., or Fotor. I am by no means an expert with photo editing , but within 5 minutes I made this new ad for the second dog. I wouldn’t normally use extreme quotes, but for a dog with no name they can work to pull people in and make people share the photo. My really bad attempt at fixing up the photo. I am a novice at photo editing, but I tried to make it more emotionally compelling. If you want to make some custom images yourself check out Dogs Trust, Home Fur Ever, and Best Friends Animal Society on facebook. Their feeds are full of great networking photos and inspiration. If you want to delve into the world of animal networking reach out to shelters and rescues. If you want to stay local use the search tool from petfinder to find some shelters and rescue organizations in your area. Some shelters are more receptive than others, but many will provide you with details on the dogs you’re interested into networking. You can also opt to look for urgent lists online; many states have volunteers that share and network animals from kill shelters. 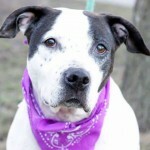 Some of the best known urgent lists that network are Urgent Death Row Dogs (NYC), Pawsitively Texas and Urgent Ohio Dogs. If you’re the creative type you can help out those urgent lists. They work with a high number of animals, and they’re always in need of people willing to help out. You might only have a photo and basic stats to work with, but they always need people with creative minds and some photo editing skills to help to spread the word. Networking is one way you can help animals in need, but it’s certainly not the only way. If you’re not comfortable networking consider helping in other ways. You can transport animals, set up websites for shelters, take photos of shelter pets, foster, donate items, or volunteer at your local shelter. But if you are going network, do it well. Be effective. Use the tactics that big organizations have been using for years by appealing to the heart. Give people a reason to be hopeful. We may not be able to change the world, but we can certainly change the world for an animal in need. Great tips! So very true. Great post. The good vs bad examples are really helpful in explaining your tips. This is such an amazing post. I am involved in animal rescue, and I have often been deleted for “spamming” up the news feed with photos of homeless dogs. I will admit that I tend to avoid the posts that say “WILL DIE TOMORROW” or something similar – they just make me feel so helpless and small. I do agree, though, that trying to get to readers’ emotions is key. A great backstory or an AMAZING photograph is what gets shared. It’s extremely sad that a lot of us who’ve networked animals are accused of “spamming.” I agree that it’s also quite discouraging when we find ourselves feeling hopeless by thinking about the real numbers we’re up against. I try and remind myself that any ONE dog that can be saved is worth it, the numbers will just end up driving us mad. This is such a fantastic post. I’m sure it will be beneficial to those of us that have been accused of ‘spamming’ with posts about homeless animals. I know that as I read the examples, I was definitely more compelled by the personal stories. Those really grab at you heart strings. 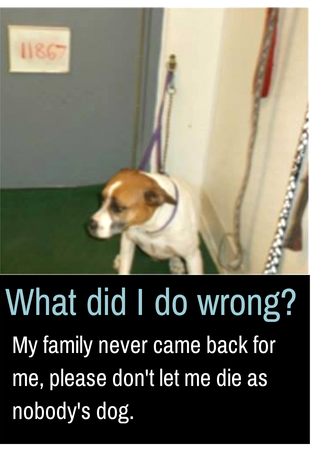 I thought you did a really good job fixing up that photo of the sad pound dog. Wow, it does really show what a difference a little editing can do. And that photo with the two dogs hugging each other, breaks my heart every time. I’m so glad to hear they got adopted together. What a sweet photo of the new family together. I love that they were adopted together; it’s such an amazing photo. Such sadness and sweetness at the same time. One thing that I love is that it seems like more and more professional photographers and talented amateur photographers are donating their time to help shelter and rescue groups. As you discuss in this post, having a great photo can make all the difference. 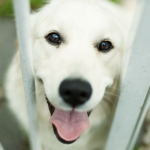 “The chance to save 1 out of 10 dogs, rather than 50 out of 500, sounds better.” So true! Response is much different and has much better effect on others. Great tactic.